Mike Snavely and Mission Imperative created 7 Live Seminar Creation or Evolution DVDs that will help your students as they study creation versus evolution. See the review of the Live Seminar Series DVDs. One of the most important goals of a Christian homeschool science curriculum is to teach creation science from a Biblical perspective. 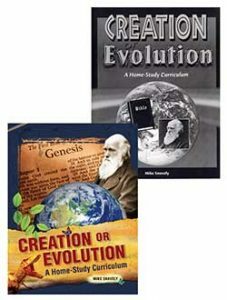 The Creation or Evolution Home-Study Curriculum Bundle includes one of each of the following items. Where did you come from? Why are you alive? Were you created? Or did you evolve? What is science: What is evolution? Does science support the theory of evolution? Could the ark have held the animals? Were there “hominids” in the past? Creation or Evolution includes work pages and tests. Soft cover non-reproducible (about 8 1/2″ by 11″ with 147 pages. The Creation or Evolution Text also includes work pages and tests. Soft cover non-reproducible about 8 1/2″ by 11″ with 147 pages. This third edition has a new cover. Minor changes were made to the text. It has the same content. 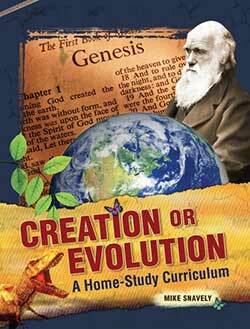 Creation or Evolution Workbook and Tests comes in soft cover and is about 8 1/2″ by 11″ with 48 pages. This is a consumable, non-reproducible student workbook and tests. Note: The Creation or Evolution Text does include the work pages and tests. Purchase this workbook if you don’t want to make copies or have more than one student.